I decided that this year I am going to send my Mom an assortment of toiletries that I have made. Along with the toiletries, I bought her the first season of I Love Lucy, one of her favorite shows. 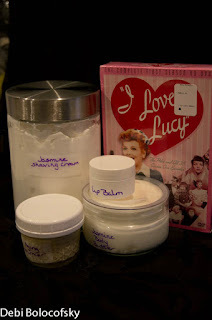 I am sending my Jasmine Shaving Cream based on a recipe from Frugal Granola @ http://frugalgranola.com/2008/10/works-for-me-wednesday-homemade-shaving-cream/. It is her recipe for Homemade Shaving Cream. I love this stuff. My whole family is using it now. The only things that I do differently for women is: I use distilled water instead of rosewater, and I use jasmine fragrance instead of the other essential oils. I do still add the tea tree oil. I am sending my Jasmine Body Butter based on a recipe from One Good Thing by Jillee. It is her Body Butter @ http://www.onegoodthingbyjillee.com/2012/02/make-your-own-moisturizing-body-butter.html. This stuff is totally amazing. It melts in your hands just like butter. It makes my skin feel divine. Again, the only difference in the recipe is that I use Jasmine Fragrance. I am also sending my lip balm. It is my own recipe. It feels great on your lips. You can find the recipe Honey and Beeswax Lip Balm @ www.adornedfromabove.com. I hope that all of you have a wonderful Mother's Day. I would love for you to share what you will be sending your mothers.